When I see that a recipe is from Cook's Country or America's Test Kitchen I am more likely to try it, even if it is something I normally wouldn't care for. 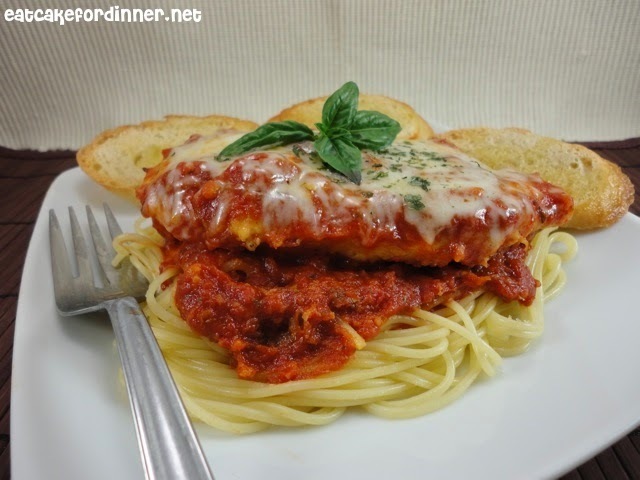 I do like chicken parmesan, but I don't think I would have ever attempted it if it wasn't for this super easy recipe. I really really liked this. Sometimes I have a hard time with homemade marinara sauce, because it tastes too much like raw tomatoes, but this one was really really good. The chicken also came out delicious. I served with some toasted baguette slices and it was a great quick and easy meal. I will be making this again! In a medium bowl, combine the crushed tomatoes, diced tomatoes, oregano, basil, sugar, salt, pepper and 1/4 cup Parmesan cheese; set aside. In a large 12-inch skillet, heat 1 1/2 Tablespoons oil over medium heat until hot. Combine the flour and panko bread crumbs in a shallow dish. Dry the chicken pieces with a paper towel. Season both sides with salt and pepper. Dredge the chicken in the flour/panko mixture, coating both sides. Gently place 3-4 of the chicken pieces in the hot oil and cook for about 3 minutes and then flip and cook 3 minutes longer until a nice golden crust has formed on the chicken (they'll continue to cook in a later step). Remove the chicken to a plate and cover with foil. Continue with the remaining pieces, removing them to the plate when they have been browned. Jenn's Notes: I used one thick chicken breast and cut it into two cutlets. I cut the sauce recipe in half. I did not add the diced tomatoes, but I added a little extra crushed tomatoes instead. If you prefer your chicken crispy, I would finish cooking it in the oven or even in the skillet and not add it to the sauce. I liked it just the way it was, but I know some people prefer it crispy. This is the first skillet version I've seen. It looks perfect! 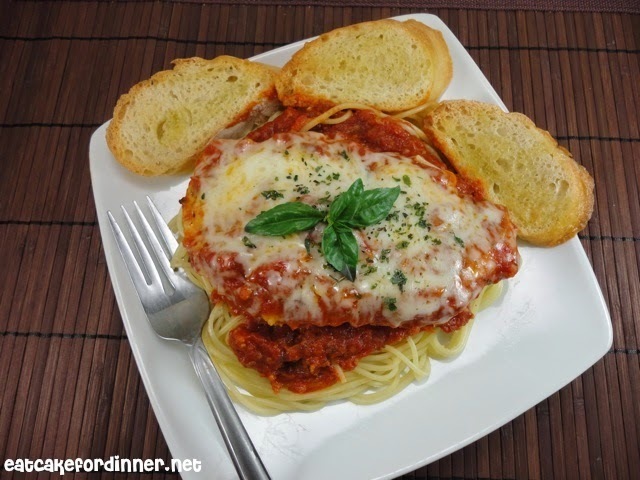 Hey, Jenn...this recipe sounds WONDERFUL & I haven't bothered to make Chicken Parmesan for YEARS!!! I sure will now. Copied & Pasted into my recipe folder already. Thanks for sharing! Chicken Parm is one of my all time faves. Thanks for sharing this recipe! I just made this for dinner tonight..it was SO YUMMY!!! Thank you for sharing! This does sound delicious!! I would probable cut the chicken in bite size pieces. Thanks! Pinning it!! !